Peder Palladius (1503–1560) was a Danish theologian, priest, bishop and Protestant reformer. Born in Ribe, Palladius later studied in Wittenberg. After the Protestant Reformation came to Denmark in 1537, Palladius became the first evangelical Lutheran superintendent (bishop). He actively advocated the removal of Catholic images and rituals, many of which he considered superstitious and idolatrous. Palladius made sure the Bible was translated from Latin to Danish, the language the common people understood. 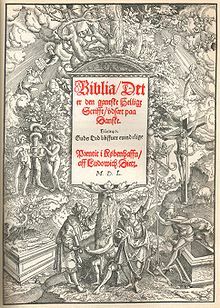 Christian III approved it in 1550 and every church could obtain a copy. ^ Brix, Hans (1927). Introduction and discussion of Palladius' Visitation. Copenhagen.